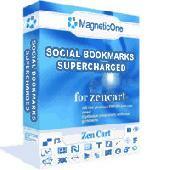 PCWin Note: Social Bookmarks Supercharged - Zen Cart Module 2.0 download version indexed from servers all over the world. There are inherent dangers in the use of any software available for download on the Internet. PCWin free download center makes no representations as to the content of Social Bookmarks Supercharged - Zen Cart Module version/build 2.0 is accurate, complete, virus free or do not infringe the rights of any third party. PCWin has not developed this software Social Bookmarks Supercharged - Zen Cart Module and in no way responsible for the use of the software and any damage done to your systems. You are solely responsible for adequate protection and backup of the data and equipment used in connection with using software Social Bookmarks Supercharged - Zen Cart Module. Site Map for Zen Cart - Zen Cart Module - Site Map for Zen Cart - Zen Cart Module - is very powerful and flexible module for dynamic site map generation. Social Bookmarks Zen Cart Module - Social Bookmarks Supercharged (120+ services) - Zen Cart Module is unique solution which will let your customers to bookmark your site: any your product, category or page into social favorites / bookmarking services. Power SEO URLs for Zen Cart - Power SEO for Zen Cart - Zen Cart module is a powerful replacement for standard Zen Cart SEO URLs feature with unique possibilities that work for Search Engine Optimization of your site. Power SEO URLs for X-Cart - Power SEO for X-Cart - X-Cart module is a powerful replacement for standard X-Cart SEO URLs feature with unique possibilities that work for Search Engine Optimization of your site. X-Cart Froogle Data Feed - X Cart Mod - x-Cart module, which would help you export easy your products into Froogle.com engine - one of the most popular free product catalog. We strongly recommend that you use Google Base data feed because of recent changes to Froogle. X-Cart 10-in-One Product Feeds - X-Cart Mods 10-in-One package includes ten available product feed packages developed by MagneticOne for X-Cart shopping cart. You will get maximum exposure, listing your products in 10 major Shopping Comparison engines. Free YUV 2 Zen Converter Lite - Free YUV 2 Zen Converter Lite is a totally free conversion program which provide you an easy way to convert YUV file to Zen format with fast speed and good output quality. Social Bookmarks Supercharged - X-Cart Mod - Social Bookmarks Supercharged (120+) X-Cart Mod is unique solution which will let your customers to bookmark your site: any your product, category or page into social favorites / bookmarking services.